Oftentimes when we realize a campaign is going viral, we can get caught up in the action. As a result, we don’t take the proper time to analyze what this means for the campaign, the brand, and how we can re-create it. Let’s dive into all of those elements by defining what viral marketing is, how brands have mastered it before, and how you can apply it to your own marketing efforts and specifically link building. Simply put, viral marketing is a content marketing strategy that aims to spread a message between various audiences. Viral content appears across the web on social media, news sites, and even in personal emails, as a large number of people feel the need to share it with others. Sometimes, “viral” can be used in a relative way. In a general sense, viral content is something hundreds of thousands of people have probably seen, but if you’re working in the pet grooming industry and 500 people view your video, you may consider that viral for your purposes. So, whenever discussing virality, make sure the definition and your parameters of that definition are clear. For the purposes of this post, virality and “going viral” will refer to general, widespread consumption of content reaching at least multiple thousands of people. Why is Viral Marketing Important? Viral marketing campaigns build massive brand awareness across the general population, allowing your business to be seen and heard by audiences it may not usually connect with. It also allows brands to start conversations and have that conversation spread on its own. There are more link-worthy benefits of viral marketing, too. These campaigns spread across resource and news-driven sites, which build authority to your site when they link back to your content. Viral campaigns also secure more social authority, especially with sites that are notoriously hard to market on, like Reddit. What Makes a Campaign Go Viral? It’s important to start by saying it’s not an exact science. If someone is claiming a guarantee to create viral content, be wary. When it comes down to it, the likeliness of something going viral can be broken down to 70% science, 20% art, and 10% luck. So, a lot of elements are involved to increase your chances of content going viral. At Fractl, we’ve studied these elements extensively, learning from our successes and failures to see what content characteristics increase the probability of virality. When we create content, there are some things we know content has to have in order to succeed. Through trial-and-error, we have determined which variables can be controlled, analyzed, or adjusted to improve a campaign’s chances of going viral. This is what we would consider the “science” part of the equation — the parts that absolutely need to exist to give content the chance it deserves to be seen. Through emotional value and newsworthiness, we attempt to identify viral content before and after it goes live. All viral campaigns stir up emotions within the reader. This makes intuitive sense, right? Think of anything you have enjoyed, reacted to, or shared—odds are, you felt something. When we recognized emotion as a key component to virality, we went one step further to identify which emotions had the most viral impact. Our research, published on Harvard Business Review, revealed that positive emotions actually had the most impact—unsurprisingly, so did the element of surprise. That doesn’t mean negative emotions don’t have their place. 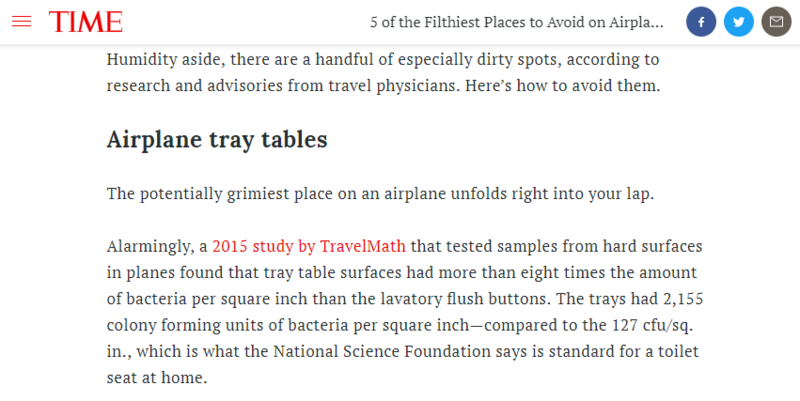 A campaign we created for Travelmath about germs on airplanes, for example, received a lot of high-quality coverage because it tapped into the emotion of disgust (coupled with the common shared experience of flying on planes. Takeaway: When you’re coming up with content ideas and creating those content projects, ask yourself: What emotions are involved here? If you can’t name any, go back to the drawing board. The term “newsworthy” is a little hard to grasp sometimes because so many things can make something newsworthy. However, the two most common and vital aspects you should consider are timeliness and scope of impact. In other words, is this information new/current, and does it impact or relate to a lot of people? Viral content needs to be relevant to its time in order to take off. If it doesn’t resonate with a common thought, experience, or event happening around the world, the campaign will be very limited if not dead on arrival. Viral marketing campaigns work because they resonate so strongly with the present emotions or thoughts we have, so we feel as though we have to share it right away. The hard part of this element is that you have to be careful to not just repeat what’s already out there; you have to add to the story in a new and creative way. The Perceptions of Perfection campaign we created for our client Superdrug Online Doctor is a great example. Body image is a huge topic around the world, with stories frequently breaking about the pressures women and men can face from society. Our campaign tapped into this constant coverage but added the new element of an international look at body image and expectations in different cultures. This added a new perspective to the conversation and added a more broad look so that a larger audience could relate. Publications all around the world covered this by highlighting their reimagination and comparing it to other countries. Takeaway:When trying to create viral content, make sure a very wide audience can relate to it and that it’s relevant to current news, trends, and human experiences. If you have an emotional, newsworthy content campaign, you’re off to an excellent start. We’d like to say that’s all you need, but we’ve found that that’s just not the case. There is another element to the mix, and that’s the art. “Art” is tough to define in this case. What we mean is that you’ll need talented, creative people working on these projects to tell these vivid stories. Your presentation is extremely important in creating content with high viral potential, so having emotional and timely data might not be enough to get you to viral heights. Takeaway:Make sure your content team or your agency is staffed with innovative, creative minds who can explore ways to illustrate information in an aesthetically pleasing, easy to understand way. This is the part everyone hates to hear. There is, unfortunately, an element to virality that’s a giant question mark for everyone, whether they’d like to admit it or not. Sometimes, even if you have the best content ever, it just won’t work out. Some things are out of our hands, and we’ve seen it ourselves. For example, maybe another huge story breaks in the same topical area, and people are drawn to that instead of what you just published. Maybe someone produces an extremely similar campaign and releases it a day before you. Maybe what people say they want to consume actually isn’t what they care about at all. The good news is, it’s never a total loss. You can learn from the campaign’s lack of success, analyze what happened to improve the process in the future, and perhaps repackage or hold onto what you have to promote at a later time when it’s more relevant. Takeaway: Don’t let this 10% scare you. Invest in taking chances so you can learn from any mistakes and reap the massive benefits of your success. If you fail, analyze, improve, and keep going. So we know what viral marketing is and how to create compelling content, but why ultimately, why should we bother? It’s clearly a lot of work and requires a ton of talent and expertise. The reason people care about viral marketing so much is that it can have a massive impact on your marketing efforts. Let’s look at some examples below. Probably the most immediate benefit of content going viral is people are more aware of your brand, particularly if you had a logo on it or if sites writing about your content cite you as the source. If your content’s featured across the web, odds are many more people are now aware that you exist, and if they already knew, they’re reminded of you, which has its own power. When we created the content, we used digital PR tactics to pitch it to publishers; after a few covered it, the story spread all on its own—showing a point that organic sharing is incredibly valuable. If you work in SEO, you already know the value of link building. If you don’t, here’s the summary: When credible sites link back to your site, that signals to Google that your site is authoritative. In essence, those other sites trust your information, so in a way, they’re vouching for you. When content goes viral and other sites credit you for the information, you can end up with a ton of backlinks. This can be a huge boost to your site as Google evaluates what you have to offer to audiences. Your rank in search can increase, and as a result, more people can end up visiting your site. For example, this chart shows backlink growth volume over time. Can you guess when the airport germ campaign for Travelmath went live? An extensive backlink portfolio is hard to get, making backlinks an extremely valuable result of viral marketing and a primary reason people invest in the endeavor. If you’re trying to create viral content, you end up creating really great stuff. Your content is useful or highly entertaining or evocative, and people appreciate what you’re producing. That can never hurt your brand, and it’s very rarely a waste of your resources. Concentrate on creating amazing content for your audience over the long-term, and you can’t go wrong. Want to talk about creating viral content for your brand? Reach out to us today!